In a unanimous action, the United Nations Security Council extended the mandate of the Organization’s peacekeeping mission in Lebanon until 31 August next year. Adopting resolution 2433 (2018), on Thursday, the 15-member Security Council also called on the Lebanese Government to develop a plan to increase its naval capabilities, with the goal of decreasing the Mission’s Maritime Taskforce and transitioning activities to the country’s armed forces. The Security Council also stressed the need for UN Interim Force in Lebanon (UNIFIL) to improve its management of civilian resources by fostering cooperation with the Special Coordinator for the country. It also urged all parties to ensure that the Mission’s freedom of movement and access to the so-called ‘Blue Line’ – separating Israel and Lebanon – in all its parts, is fully respected and unimpeded. Originally established in 1978, UNIFIL was greatly reinforced after the 2006 fighting to oversee the cessation of hostilities between Israel and the Lebanese group Hizbollah. It is tasked with ensuring that the area between the ‘Blue Line’ and the Litani River is free of unauthorized weapons, personnel and assets. It also cooperates with the Lebanese Armed Forces so they can fulfil their security responsibilities. 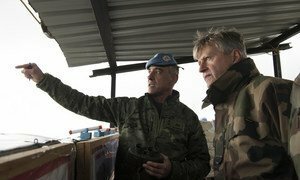 The head of United Nations Peacekeeping Operations has wrapped up a visit to Lebanon with a call on leaders from Lebanon as well as Israel to take advantage of the role UN peacekeeping can play in finding political solutions to conflict.